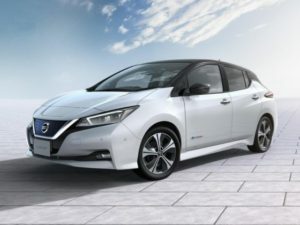 Nissan’s second-generation LEAF electric vehicle will arrive in Europe early next year, offering 50% more range, increased power and partially-autonomous drive. The new Nissan LEAF offers a range of 235 miles. Replacing the world’s biggest-selling electric vehicle, with 283,000 sold since 2010, the all-new car is almost identical in size to its predecessor, but with a design aligned more to the Qashqai and Micra than the outgoing model. Performance has increased, from 109bhp to 148bhp, and developments in battery technology have enabled the battery capacity to increase by a third, to 40kWh, without changing its external dimensions. Fully charged, it offers a range of 235 miles (NEDC), 80% of which can be restored in 40 minutes, while a 100% charge takes between eight and 16 hours. Nissan has also hinted at a longer-range, higher-powered version, likely to feature a 60kWh battery pack to rival the Chevrolet Bolt (sold in Europe as the Opel Ampera-e), which could take the range over 300 miles. New technology includes ProPilot driver assistance, as used on the updated Qashqai, and the ability to undertake parking manoeuvres hands-free while it selects gears and operates the throttle. All new LEAFs will also feature the e-Pedal, which means 90% of driving can be carried out just by pressing and lifting off the throttle pedal. To read our spotlight feature on the new Nissan LEAF, click here. For more of the latest industry news click here.